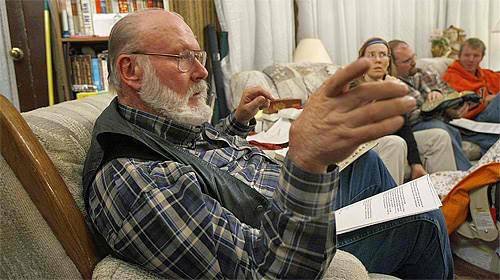 * Well-known Polygamist Leland Freeborn Debates Christian Pastor Bob Enyart of Denver Bible Church. God officiated the first marriage by creating one woman for Adam, and in establishing marriage He stated that "a man shall leave his father and mother and be joined to his wife, and they shall become one flesh" (Gen 2:24). And the nearly balanced worldwide birth ratio of boys and girls provides evidence that God designed human beings for monogamy. However, the Bible has many references, negative, neutral, and even positive, to polygamy. Why then do Christians stand almost unanimously against a man simultaneously having two or more wives? * For Related Sinfulness: See kgov.com/religious-acceptance-of-immorality, kgov.com/forgoing-the-marriage-license, and kgov.com/mormonism. * Personhood: is the most important human rights movement of your lifetime. Will you be one who fights to end the systematic dehumanization and murder of an entire class of human being? If you live in any state in America, you can advance personhood via the 2010 ballot or in one of three different ways. If you live in Colorado join by calling or e-mailing Colorado Right to Life! Today’s Resource: Enjoy listening to Bob Enyart’s Bible study on miracles and healing titled Details Galore! Did you realize that men often react negatively to displays of God’s power? The ten plagues in Egypt, the forty years of miracles in the wilderness, and Christ’s wonders in Chorazin, Bethsaida, and Capernaum all left onlookers in a state of unbelief. Bob's study on CD, Details Galore, analyzes the scriptural material on this aspect of human behavior by evaluating every single miracle listed in the Bible! Also, you can read this same analysis in Bob’s life’s work, the best-selling book, The Plot!